Our home has come a long way since we bought it in 2014. 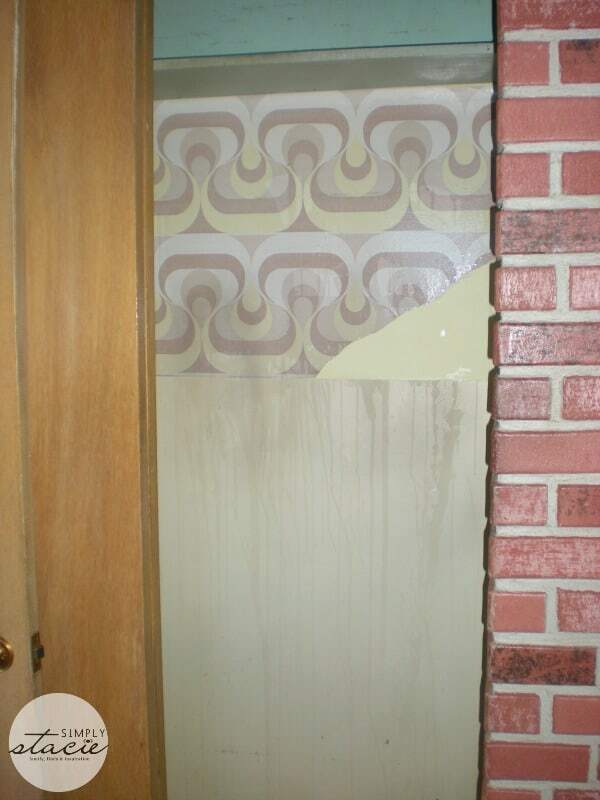 It was in desperate need of some updates and most of the rooms hadn’t been touched since the 1960s. My family came in right after we took possession and started a few small renovations even before we arrived from Nova Scotia. 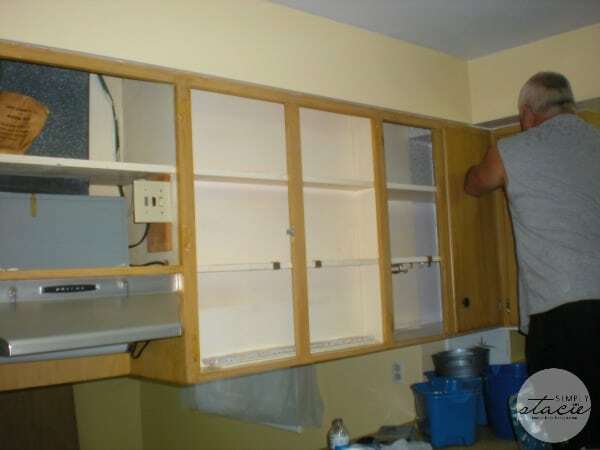 They gave the kitchen a quick makeover by knocking out some upper cabinets and repainting the pantry. They also tore out the shag carpet in the hall and bedrooms and put laminate flooring in its place. It was already a big change when we finally got there to move in! 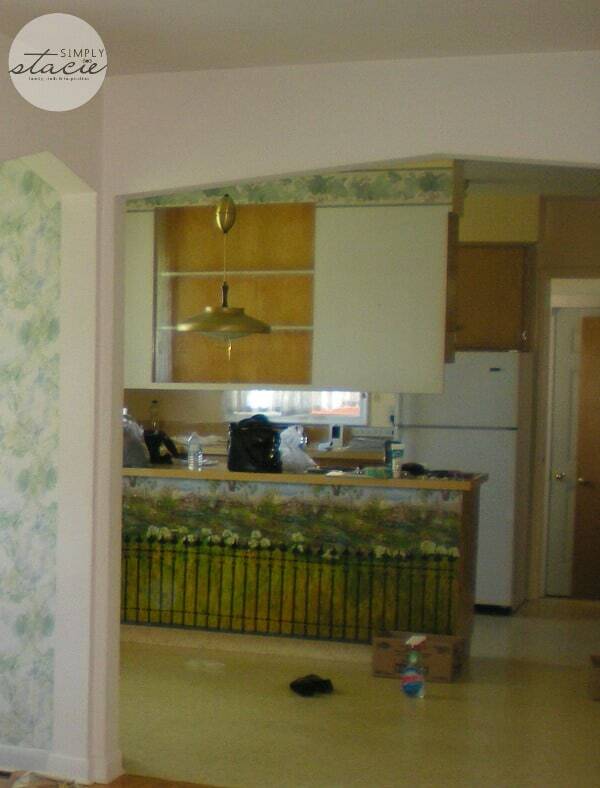 Here’s a look at what the kitchen looked like when we bought the house. As you can see, it’s pretty dated. My dad is hard at work! 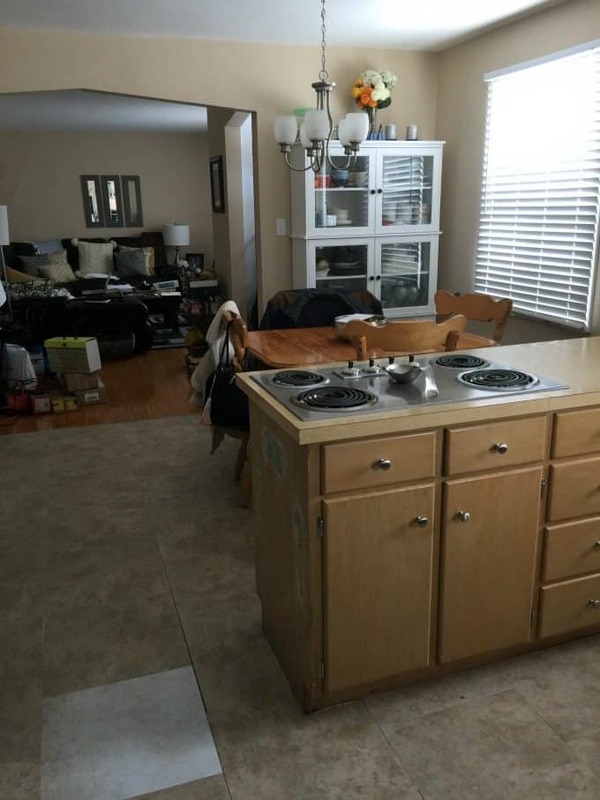 We kept the “new” kitchen for almost three years before we decided it was time to give it a complete makeover. I wanted a white kitchen to brighten up the place. Take a look at the new and improved before pictures. Notice that glaring white tile? 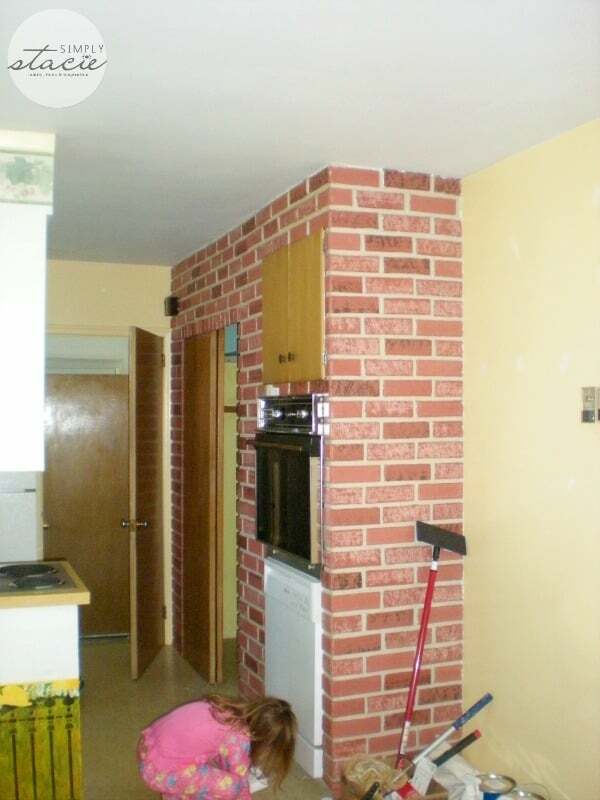 It was a bad tile in the batch, yet the contractor used it anyways….that’s a whole other post. I have a few reno horror stories to fill you in on later. The peel and stick flooring was starting to pull away and looked terrible. I don’t recommend this type of flooring for a kitchen. Lesson learned. 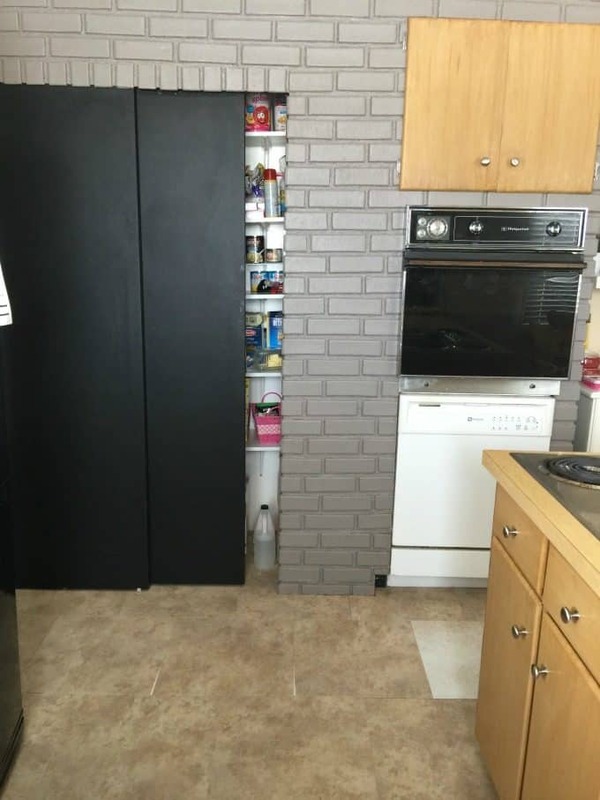 My aunt Debbie painted the pantry and did a great job. We added a chalkboard sliding door. It’s not real brick, BTW! In March, we went to The Home Depot to talk about getting a new kitchen and get the ball rolling. It took a few months to get everything in place and they started work at the end of May! Currently, it’s almost done. I’m waiting on the countertop, cooktop and sink. I’ll do another post with my new kitchen reveal so stay tuned! It did come out really nice. Many years ago, my now ex and I wanted to move to Nova Scotia – we bought land in Dingwall. So pretty up there. Can’t wait to see the reveal! 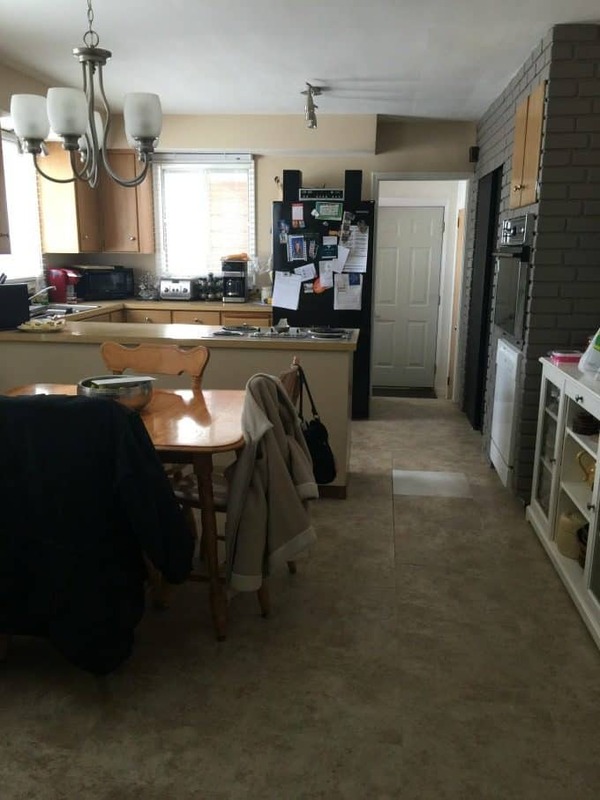 I’m so happy you got to do an update we just recently removed the wall dividing my kitchen and dining room and i love the open space! 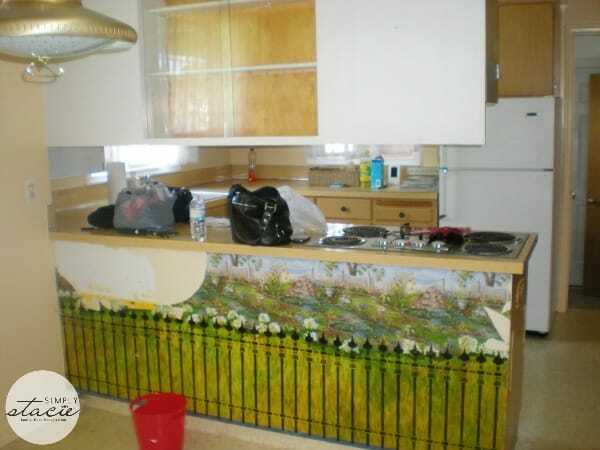 Kitchen renovations are very necessary in some cases. My favourite feature is the sliding chalkboard door. I love the sliding chalkboard door on the pantry ! Brilliant! It’s incredible that they put that glaring tile in, guess they must have been blind! Hope they give you a replacement and do the actual replacing too. 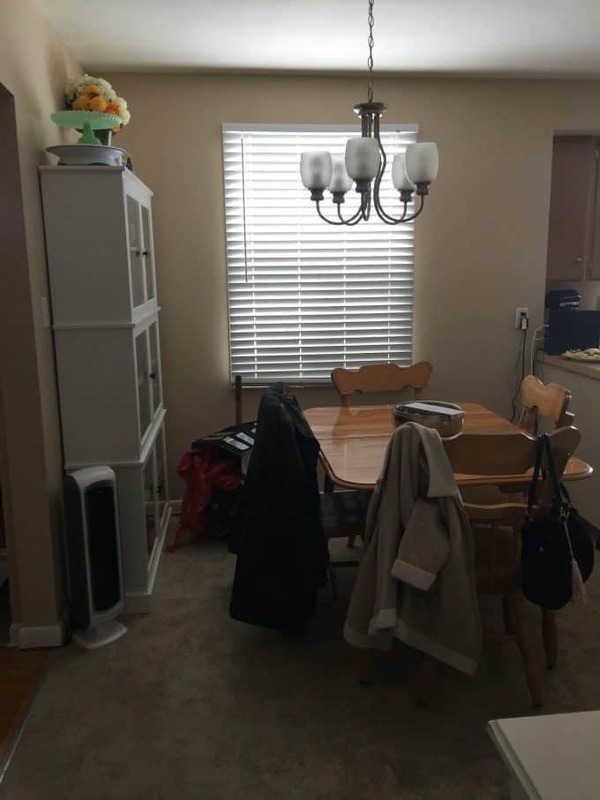 Can’t wait to see the reveal… though i like the “new” kitchen you came up with when you fixed it the first time (other than the odd floor… can’t believe a contractor would do that!). I can not wait to see the big reveal and see how your kitchen turned out. I bet it looks so pretty! Yeah, I can see why you wanted to do a reno. I don’t love my kitchen, however, it is okay enough for now. Isn’t is amazing that most people who go through renos of any kind end up having those terrible stories? Oh dear! Can’t wait to see the reveal, I am sure it will be beautiful. One of these years I would love to do our kitchen over. Your kitchen is already pretty cute. I can’t wait to see the new and improved renovation pictures. We really want to redo our kitchen as well. It’s always fun to be able to redo a kitchen since it’s such an important part of a home. I’m looking forward to seeing what you do. I love it; it’s beautiful! I’m thinking of painting my laminated kitchen cupboard. We were going to change them and buy from IKEA a couple years ago but the measurement were totally off, I would have need to move the sink for it to work. I try other place and would need custom made and that is too expensive. My appliance are white so I think I’m going to go with grey. Wow! It’s really coming together well! Those were some unique design choices in the before pictures. 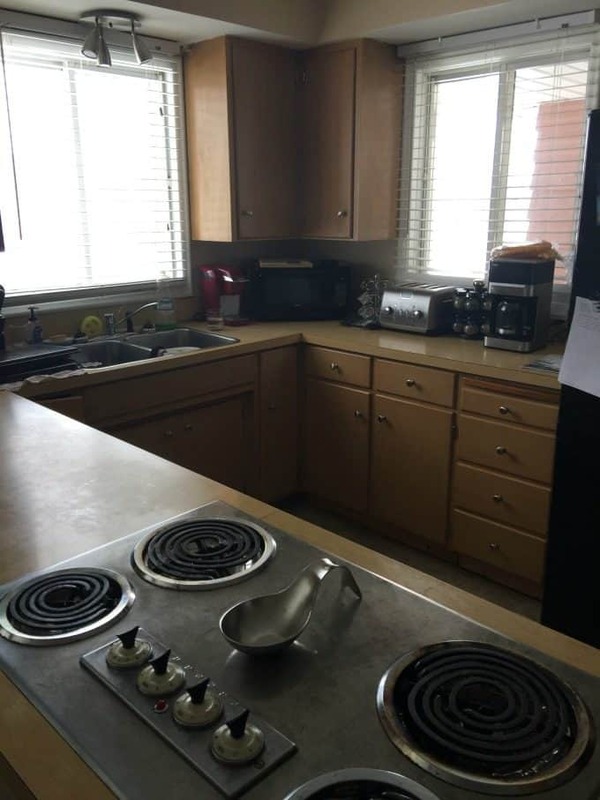 Our kitchen was just redone before we bought the house but I still would like to make changes to better suit us. I love looking at kitchen makeovers as I’d love to get ours done. Can’t wait to see the finished look.